What are the Digital Humanities? What are they in Norway? In Norway, the term digital humanities is not really established, although a lot of work has been done here that could well be called digital humanities – at the University of Bergen a few projects that come to mind are the classics: Wittgenstein Archives, which digitized and organised all Wittgenstein’s nachlass, Knut Hofland and Gisle Andersen’s Nyord i norsk, an engine that goes through Norwegian newspapers every day and finds new words, or Stadnamnsamlinga by the Nordic scholars in my own department, where recordings of how people say local place names throughout Western Norway are systematised, transcribed and made searchable. The computational linguists just down the hall from my office do amazing work, for instance building digital infrastructure for language research and much more that I should find out more about. I think projects like Dag Elgesem and Andrew Salway’s blog mapping should count, too, although some might say this is social science or communication studies rather than the humanities. And of course I would include our own ELMCIP Electronic Literature Knowledge Base and the work we’re doing with the data there using network analysis, word clouds and visualisations. Today I’m at a seminar at the University of Oslo called “What are Digital Humanities?“, organised by the very enterprising PhD student at ILOS Annika Rockenberger. Espen Ore’s talk about the history of digital humanities in Norway asks why this rich tradition hasn’t led to a strong field of digital humanities in Norway today. Of course, it wasn’t called digital humanities back then, but there has been work on computing in the humanities since at least 1972. 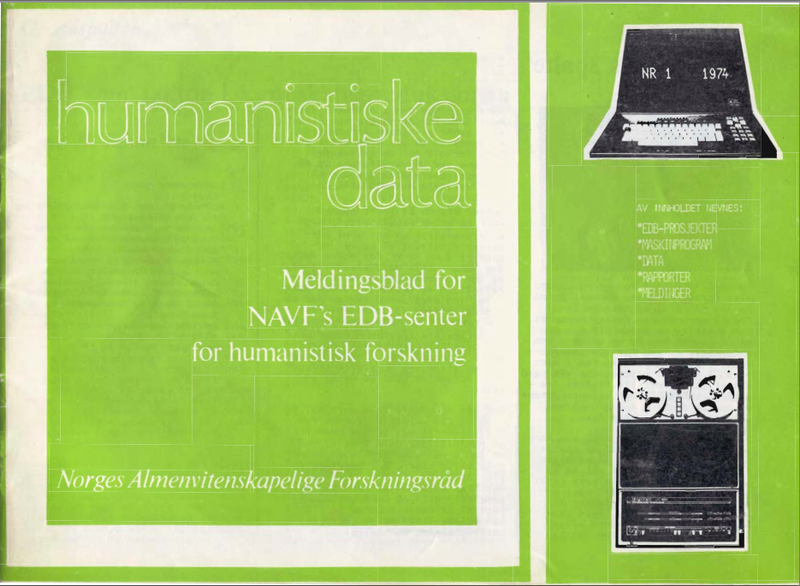 Humanistisk data was a journal published from 1973 until 1991, and in the second issue there is a list of humanities computing projects in Norway. Of course all issues have been digitised: charmingly scanned many years later so you can see the tears and dogears in the physical copies. The front page of the second issue of Humanistiske data, 1/1974. This issue includes an overview of humanities computing projects in Norway at the time. Espen Ore worked just down the hall from me at my first job, when I was a research assistent on the Lingo project building a MOO for learning about Shakespeare. NAVFs edb-senter for humanistisk forskning was a national institution (with a still-existant sister: NSD) but became part of the University of Bergen in 1992, as Humanistisk datasenter, with a lot of external funding and some base funding from the Faculty of Humanities. Then in 2001, the Faculty of Humanities cut the funding, and Humanistisk datasenter was renamed Aksis and had to rely entirely on external funding. The remnants are now Uni Digital, though I don’t think there’s a lot of continuity there. Perhaps the multi-disciplinarity of humanities computing was what led to its lack of visibility. Or perhaps its project-based nature, and the fact that the many excellent projects were never closely integrated into a single department or curriculum – it remained outside of the university proper, as it were. My talk was about the work we’re doing with the ELMCIP Knowledge Base and was largely based on the visualizations Scott has been doing this spring, although I also talked about the project we did in Amsterdam in January graphing the books people buy about the digital humanities on various Amazons in order to get a picture of the field. Here are the slides, which are a very lightly edited version of the slides as Scott made for the HASTAC conference in April. Tomorrow the group here will be discussing how to move forwards with the digital humanities in Norway. 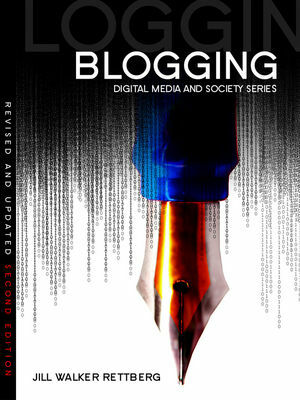 Should it even be called the digital humanities? In Germany the chosen term is e-humanities instead, apparently pretty much as a token of opposition to the Anglo-American provenance of “digital humanities”. I think we should be pragmatic about it: digital humanities is a term that works right now. Another term will work in ten years time. But in any case, humanities projects that use digital methods need to become more visible in Norway – simply having a website with a list of examples would be a huge advance. Perhaps a Norwegian or Nordic chapter of the European Association for Digital Humanities would be good. Hearing the history of how the digital humanities (or humanities computing) were strong and then pretty much disappeared in Norway I think getting more digital humanities into undergraduate curricula in various disciplines is important. We have one digital humanities course at the University of Bergen, but we should aim to develop a series of web-based tools that make it easy to integrate digital methods into humanities courses. 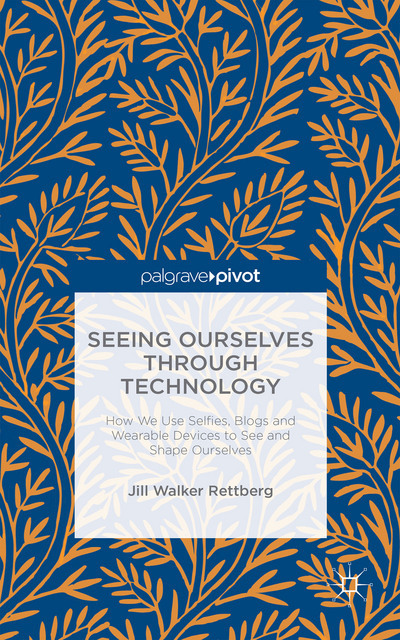 Thanks Jill for your blog post! You did outrun me on this (but there was a lot of mousse au chocolat left over I had to look after). We are forming an official Research Group for Digital Humanities at the University of Oslo’s Faculty of Humanities right now. Regarding a Nordic countries network for DH: we are going to have our first big meeting in October here in Oslo where we discuss that issue. Consider yourself invited!